I plan on getting a smile makeover. I keep hearing the dentist is the key, but how in the world do you know if you’ve got the right key? Beautiful smiles require great dentists ! You’ve asked a great question and doing so will save you a great deal of agony. There have been countless cosmetic dentistry horror stories of patients from another practice who came to us in tears needing their “smile makeover” fixed. The problem most patients run up against is there is not a recognized specialty in cosmetic dentistry. That means any general dentist can call themselves a cosmetic dentist if they dabble in one or two cosmetic procedures. Unfortunately, to get great results in cosmetic dentistry, it takes a lot more than dabbling. Here are three important things to look for in a cosmetic dentist. This one is hard to quantify, but you can quickly tell if a dentist has it or doesn’t. Dr. Hall calls this trait, “The root of a good cosmetic dentist.” They know you want a beautiful smile and they will make sure you get one you can be proud to share. In general dental school, dentists are taught they know better than the patient. Cosmetic dentistry is different. It’s the way the patient sees their smile that matters. They’d never let a patient leave unhappy and will make any changes necessary to make sure it is the smile of your dreams. How to do stunning smile makeovers isn’t taught in dental school. It requires a dentist’s willingness to invest in extensive post-doctoral training. They’d invest time and money in continuing education at reputable institutions. Smile makeovers are a type of art form. As with any art, some artists are better than others. The evidence isn’t necessarily in the art school they went to but the results of their work. Never hesitate to look at a cosmetic dentists smile gallery to see what type of results they get. Especially look for specific examples of the procedure you’re getting. if you want porcelain veneers, ask to see those pictures. If you have tetracycline stains, see what type of success they’ve had covering those. The American Academy of Cosmetic Dentistry realized the predicament patients were in locating a great cosmetic dentist. Because of that, they began an accreditation program so dentists with the right skills could have a way of letting patients know. They have to pass stringent oral and written exams as well as provide visual evidence and a large and varied number of cases demonstrating their artistry. If you’re really looking for the best, go to aacd.com and do a search for an accredited cosmetic dentist. I’ve consulted with two dentists in my desire to improve my smile. I’ve got tetracycline stains which have embarrassed me for years. I’ve spoken to two dentists. One suggested porcelain crowns. The other suggested I get porcelain veneers. Is one a better treatment than the others? Beautiful smiles require great dentists! It’s great that you’re doing your due diligence. To help with this, I want to shift the way you’re approaching this just a bit. While I do have a treatment that I think is better than this and will tell you which it is, the more important decision is what type of dentist do you need. Tetracycline stains are among the most difficult type of cosmetic issues to treat. Whichever procedure you decide on has to be opaque enough to cover the stains and translucent enough to be beautiful. It takes a truly skilled cosmetic dentist with an artistic eye to create the type of smile you’ll want. 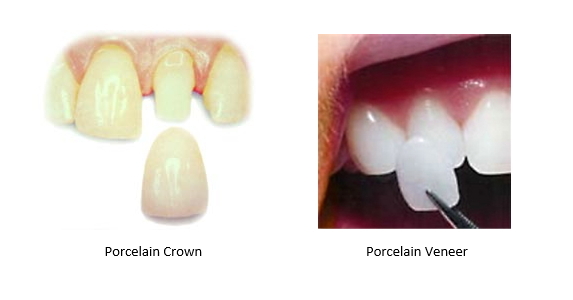 As for the procedure, porcelain crowns can be made to be beautiful. But, it’s quite aggressive. You’re removing healthy tooth structure for no reason. From then on you’ll be stuck with crowns. You can never go back. The only dentist that would recommend crowns for a smile makeover is one who’s not comfortable placing porcelain veneers. That alone tells me he’s not a skilled cosmetic dentist. You should pass. Now just because the other dentist picked porcelain veneers, doesn’t mean he’s a skilled cosmetic dentist. You’re going to have to check. It’s almost impossible for a patient to distinguish the skill of one cosmetic dentist from another without doing hours of research. Fortunately, the American Academy of Cosmetic Dentistry (AACD) does that for you. They have an accreditation program that helps patients to know what dentists can offer a beautiful smile guarantee and really provide it. I’m going to suggest you go to aacd.com and look up accredited dentists in your area. If you don’t have one in your immediate area, it is truly worth it to travel a bit for the smile of your dreams. Why is it you’re always hearing patients need to find a phenomenal cosmetic dentist to get their smile makeover when in reality 99% of dentists send the work out to a lab to do? 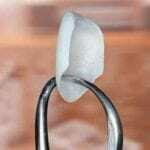 The “great cosmetic dentists” are often more costly. Couldn’t I find a great lab and ask a mediocre dentist to send the work to them? Beautiful smiles require great dentists and great labs! This is a very astute question. It seems logical that this would be a great way to get around costly cosmetic dental work. For instance, it’s the sculptor that matters, not where the sculpture is sold. Unfortunately, the analogy doesn’t work completely for dental care. The lab is dependent on the skill of the dentist and vice-versa. The dentist does all the tooth preparation and planning. First, their need to be quality impressions made which are sent to the lab. The preparation of the tooth also has to be done precisely. These are absolutely essential to a successful case. Next comes the prescription. A better analogy would be for this situation would be, does the quality of the doctor matter when it’s the pharmacist who provides the medicine. If the doctor diagnoses the problem wrong, there’s no way you’ll get better, even if the pharmacist follows his instructions perfectly. It’s the dentist who gives detailed instructions about the shade map of the final result. This includes the surface texture, the degree of translucency, a mock-up of the final result, and many other details. Once the porcelain veneers or crowns comes back from the lab, the dentist checks everything over and makes sure it was done properly or whether it needs to be sent back to the technician. Finding a great cosmetic dentist is much easier now thanks to the American Academy of Cosmetic Dentistry. They set up an accreditation program to help patients find the cream of the crop when it comes to cosmetic dentists. Those seeking accreditation have to pass stringent oral and written exams as well as demonstrate their artistry on a large list of specific cases, showing that it’s their own work. Any dentist who becomes accredited through the AACD is an artistic dentist with skills that can provide you with a gorgeous smile. In fact, most of them have a beautiful smile guarantee. Can a Cosmetic Dentist Fix Spaces Between My Teeth? I have some spaces between my teeth that I want fixed, but I don’t want metal braces. Are there cosmetic options? You have quite a few options to fix the spaces between your teeth. If you want to close the spaces, you have options other than traditional metal braces. 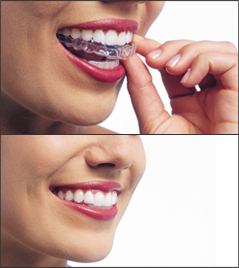 Invisalign is a brand of orthodontics which uses invisible aligners to straighten your teeth. They’re very effective, working in less time than traditional braces. The aligners have the benefit of being able to double as teeth whitening aligners. That way you can whiten your teeth and straighten them at the same time. Tooth bonding: Depending on the size of the gaps between your teeth, dental bonding is a fantastic, fairly inexpensive option for you. Porcelain veneers: If there are other things you want to change about your teeth, then veneers are your best option. They can change anything—the shape, size, color, and character. If you choose the cosmetic option over the orthodontic option, it’s important you choose your cosmetic dentist carefully. You want to make sure the smile you get will be a beautiful one. Not every dentist can pull that off. It takes both technical knowledge as well as an artistic eye. It’s very challenging for patients to know who is capable of that type of advanced cosmetic work. Because of that, the American Academy of Cosmetic Dentistry (AACD) started an accreditation program. It’s designed to test dentists on their technical skill and their artistic ability. There are stringent oral and written exams and they have to show a series of cases they’ve done of specific procedures to make sure they create not just technically proficient but gorgeous as well. If you want a beautiful smile, go to an AACD accredited dentist. What’s the Difference Between a Cosmetic Dentist and a General Dentist? I can’t seem to figure out the difference between a general dentist and a cosmetic one. My dentist is a general dentist but he also does cosmetic things like teeth whitening and Lumineers. Is there a difference or do they just label themselves for the kinds of patients they want to draw and do both kinds of work? There is no difference as far as a specialty. There isn’t a recognized specialty in Cosmetic Dentistry with the American Dental Association. Any Cosmetic Dentist is actually just a general dentist who also does cosmetic work. That being said, there is a huge difference regarding quality and beauty that varies from dentist to dentist and it doesn’t matter which label they use. A good example of this is the image above. Both smiles are of the same woman and both smiles had the same type of dental work done. On the left, she had dental crowns. On the right, she had dental crowns. The only difference is the dentist. The dentist on the left didn’t understand what materials to use to give her a natural looking smile. He technically knew how to make and bond dental crowns and is likely a decent general dentist. But, if you want anything appearance related it will take someone with both technical skill and artistry. That’s what the dentist on the right had. Most patients would be surprised how much business comes to high-quality cosmetic dentists, like Dr. Mike Malone, because they are fixing botched cosmetic cases. I suspect your dentist isn’t a high-quality dentist. The only reason I’m saying that without seeing examples of his work is his reliance on Lumineers. These are generally marketed to inexperienced cosmetic dentists as being easy to place. But, the results are often opaque and bulky. So, how do you not end up with a smile makeover disaster? If I were in the market for a complete smile makeover with porcelain veneers, I’d look for a dentist who’s reached accreditation level with the American Academy of Cosmetic Dentistry (AACD). There is a difference between being a member of the AACD and an accredited member. Any dentist can pay the fee to join. But, to become accredited, you have to pass stringent oral and written exams as well as demonstrate your artistry in many, many recent cases. They’re among the top 1% of cosmetic dentists in the country. If you’re looking for a beautiful smile, they’ll create one for you. In fact, many of them have a beautiful smile guarantee. Can Invisalign Give Me a Quick Fix? I’ve had braces in the past when I was younger. Over the years, some mild spaces have developed. As an adult, I do not want to go through braces again. However, I do want to close these spaces. Is there a possibility Invisalign can give me a quick fix on these spaces? There’s a lot to fix on my teeth, but I feel like closing these will give me a good start. If you’ve only got some mild spacing issues, then you may be a good candidate for Invisalign Express. That can tighten up your bite in just s few months. However, you mentioned there are other issues about your teeth you’d like to fix. You didn’t mention what they were. If you want to fix everything at once, instead of in little installments, I’d like to suggest porcelain veneers. Porcelain veneers are tiny wafers which can completely remake your smile, changing everything about it. They can simultaneously change the shape, size, and color of your teeth, giving you a stunning smile. Can Any Dentist Do Invisalign or Porcelain Veneers? Cosmetic dentistry isn’t a recognized specialty. While any dentist is technically allowed to do either procedure, the results you get vary widely from dentist to dentist. With Invisalign, you’ll be safe with pretty much any dentist. The treatment plan is designed by computer. The dentist is there mostly to make certain your teeth and gums stay healthy throughout the treatment. Porcelain Veneers are completely different. It requires not just advanced skills, but an artistic eye. They’re designing your smile. You want a dentist who’s gone through extensive post-graduate training. I can’t tell you the number of people who’ve ended up coming to Dr. Malone’s office begging him to fix the disastrous smile “makeover” another dentist created. You want to go to a dentist who’ll get it right the first time. Look for a dentist in your area who is accredited with the American Academy of Cosmetic Dentistry (AACD). Accredited dentists have passed extensive testing in their cosmetic skills as well as demonstrated artistry on cases they’ve personally designed.